Description: Biennial, 20-37 cm tall; stems solitary to several, usually erect, leafy, densely covered with sessile to short-stalked, 3-celled, light-colored capitate glands with some short and longer simple nonglandular hairs; leaves 1-6 cm long, 0.5-2 cm wide, irregularly crenate-dentate, densely covered with short, light-colored, stipitate glands, petioles of basal leaves about 12 mm long, petioles of upper leaves short to none; inflorescences numerous, reddish, leafy-bracteate, in terminal cymes on main stem and shorter lateral branches, cymes to about 5.5 cm long in fruit; sepals elliptic to linear to narrowly oblanceolate, about 3.3 mm long; flowers tubular to tubular-campanulate, light violet, 4-5 mm long, lobes 1.5-2 mm long, puberulent; stamens exserted 5-6 mm, dark violet; style exserted, divided 3/5 of its length, hirsutulous basally; capsule 2.6-2.8 mm long, 1.8-2.1 mm wide, glandular and hispidulous; seeds oblong, black, 2.2-2.7 mm long, 1.1-1.3 mm wide, excavated ventrally, margins and ridge entire to corrugated, dorsal surface pitted and cross-corrugated. Flowers late July through September. Similar Species: The combination of characteristics described above as well as its habitat make this species readily identifiable. 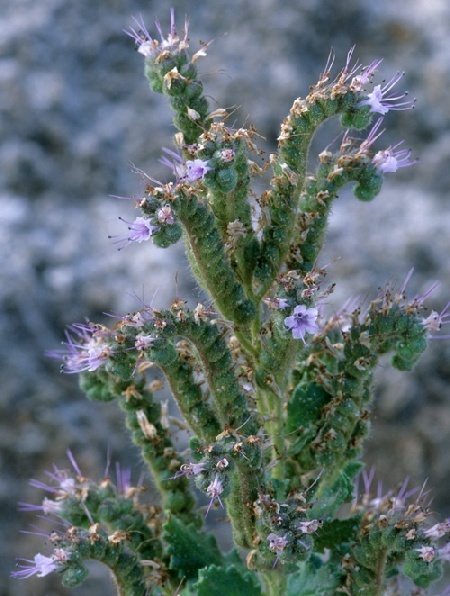 It may be confused with the Phacelia integrifolia group of species including P. texana, which also occurs on gypsum, but in the southeastern part of the state. Phacelia texana is usually a large annual with long branches from the base. Phacelia sivinskii is a robust biennial with a strict, single stem. Short, floriferous branches on well-developed individuals extend from the base to the top of the plant. Distribution: New Mexico, Cibola, Sandoval, Socorro, and Valencia counties. Habitat: Restricted to gypsum from the Upper Jurassic Todilto Formation of northwestern and north-central New Mexico (Cibola and Sandoval counties) and from the Permian Yeso Formation (Socorro and Valencia counties) in sparse juniper/desert scrub communities; 1,800-1,960 m (5,900-6,450 ft). Remarks: Although Atwood and Welsh (2005) stated that Phacelia sivinskii is restricted to the Todilto Formation, which occurs only in northern New Mexico (north of about Albuquerque), collections from Socorro and Valencia counties, are from the Permian Yeso Formation (Weber and Kottlowski 1959). Small to extensive outcrops of gypsum of various ages occur in many places in New Mexico. It seems possible that the distribution of this species is much larger than is currently documented. Dropped in 2017. Although endemic to NM, it no longer fits the definition of rare by the NMRPTC. Too widespread (over 100 mile range), adapts well to gypsum mining disturbance. Conservation Considerations: Gypsum is mined from some of the states surface deposits. A large, active mine extracts the material from White Mesa (Todilto Formation) near San Ysidro where Phacelia sivinskii is relatively common. *Atwood, N.D. and S.L. Welsh. 2005. New species of Mentzelia (Loasaceae) and Phacelia (Hydrophyllaceae) from New Mexico. Western North American Naturalist 65(3):365-370. Weber, R.H. and F.E. Kottlowski. 1959. Gypsum resources of New Mexico. Bulletin 68, New Mexico Institute of Mining and Technology, Socorro, New Mexico.